His passion surrounds organizational culture and strategizing ways to keep a people inspired and find meaning at work. He previously led several of Proctor & Gamble’s multi-million dollar businesses, all while consistently transforming cultural health and transforming business results. Scott regularly writes for national publications about entrepreneurship, company culture, and how to get employees motivated, and was named a “CEO Thought-Leader” by the CEO Executive Guild and a “Top 50 Leadership Innovator” by Inc.
Read on for our full interview with Scott and learn why he doesn’t believe in inbox zero, the huge downside to meetings, and the important reason you shouldn’t fear failure. I know that my sharpest thinking time is first thing in the morning, so I arrange my day accordingly. The first 90 minutes are uninterrupted time to scan the variety of news sources I have bookmarked as inspiration for article ideas for Inc. or for supporting research for books in progress or developed keynotes. I’ll then convert any wisps of inspiration into “placeholder” text: I’ll go ahead and write a few options for titles of an article, I’ll write out some new lines for the keynote speeches, I’ll make notes for applying new ideas to my book. The key is to stay focused on “heavy-lifting” tasks for the brain and then to capture the output. After the first 90 minutes of the day then, I’ve deployed my best mental faculties to the most important elements of my business model, and I’ve got something tangible to build from later in the day. I break my day into two distinct halves based on my personal work patterns and the need to accommodate for my mental energy peaks and dips. From morning until lunch I work on my most cognitive tasks. I separate the day with lunch and exercise each day. This allows me to have more energy and focus in the back half of the day. At the beginning of the back half of the day, I engage in another round of “thinking-heavy” work, then I migrate to maintenance work as my energy wanes. For example, I’ll start the back half of the day by writing thoughtful proposals for clients or cranking out a few more pages for my book, then I will shift to sending follow-up emails, coordinating changes to my website, or plotting some events out on my calendar things like that. I like Scrivener. It’s software for writers that provides many benefits over Microsoft Word. It’s built based on the insight of the writing process – how we tend to organize, reorganize, what must be kept track of along the way, what’s the easiest way to edit a document, etcetera. I also like Unsplash.com. It’s an art-image website with great, free pictures you can download and use for your website, articles, keynotes, etc. The best thing about it is that it makes it easy for you to give credit to the photographers who took the pic you’re downloading. This is of great benefit to the photographers because it helps them get their name out there and build their brand. So you feel like you’re doing good while getting great art images. I do a quick scan each morning for subject titles that would relate to my top 2-3 business priorities. I’m very disciplined about not getting “sucked in”. I then check it again at the end of the day as the last part of my “maintenance phase” of the day. Meetings – especially ones that land on my calendar in randomly interspersed fashion. Having 3 meetings spread throughout the day several days a week is very disruptive for me as it interrupts “flow” time. I schedule meetings now usually on a Thursday or Friday only, back to back starting in the morning but never extending past the afternoon. This preserves a period of uninterrupted time for me even on “meeting days”. This obviously also requires that I’m much more brutal with meetings that are actually required. Meeting requests from clients take precedent, then I prioritize aggressively or say no if I feel the meeting is actually something that can be handled by email. If the objective of the meeting isn’t crystal clear or it isn’t clear how I can add unique value, I don’t attend. I simply stopped doing “informational/update” type meetings. I find it’s very important to “Catch the Drift.” By this, I don’t mean make sure you understand and comprehend, although that’s always a good thing. By this I mean catch yourself when your mind/attention/focus is drifting off. To combat this I have one sentence written on a piece of paper that I keep at my work desk (within easy-eyesight). It says: “What has my attention right now?” By constantly keeping this question in front of me, I stay aware of what my mind has wandered too. I don’t beat myself up when my attention has wandered, I just gently prod myself to get back on track. I also practice the Pomodoro technique. I work for 90 minutes uninterrupted then I take a break for 5 minutes. For others it’s not quite 90 minutes, it might be as short as 20-25 minutes. The important part is that this technique works with your body’s natural rhythms and serves to replenish energy in small doses. I have learned that failure is not to be feared. Your fear of failure can be reframed – which is required because fear engages your brain in the wrong conversation. What if I told you that there are only 3 ways you can actually fail? When you quit, don’t improve, or never try. What if I told you that fear is an event, never a person, as Zig Ziglar used to say. What if I told you that your fear isn’t there to scare you, it’s there to tell you that something is worth it? What if I told you that F.E.A.R. has two acronyms – you choose which one you’ll live by. It’s either Forget Everything And Run, or Face Everything And Rise. What if I told you that failure doesn’t happen to you, it happens for you? And what if I told you that when you fail, you’re not the one who suffers – it’s your ego who suffers. And you and your ego are not the same things. I just reframed fear of failure in a half-dozen ways so it can be done, and it is unquestionably powerful to do so. Productivity is aligning your priorities with your natural/preferred work rhythms to maximize the output of work that matters. The most powerful belief I’ve incorporated into my life is to chase authenticity, not approval. When you seek approval you’re seeking external validation which is an empty victory at best and elusive and confidence/soul crushing at worst. It is a never-ending, insatiable pursuit. But when you seek authenticity, you’re focused on living true to your values, up to your own standards – not someone else’s. You focus on self-improvement and whether or not you’re getting better than you were yesterday–not better than someone else. You strive each day to serve what matters most to you and to serve in a way that leverages your unique talents and strengths, your authentic self, not just who you’re “expected” to be. I’ve gotten better at saying no to people looking for “free” services. It’s very difficult for me because I chose my “second-act” of a speaker, writer, trainer, 1 on 1 coach so that I can SERVE. My expertise is in teaching audiences how to deeply motivate/engage themselves and others for peak performance and fulfillment–to help others become better versions of themselves. So I’m in high-demand. And yet I still have a hard time saying no to those seeking this servitude gratis. I’ve learned that when I’m serving too many people for free, it devalues my services to others who would pay for it, making them less likely to bring me in to help them/their organization. This works against my mission. And when I’m overstretched it’s very difficult to summon the amount of energy that I put into each opportunity to serve. So I’ve gotten better at respectfully declining requests for “free”, as hard as it is, and to stop beating myself up when I do say no. 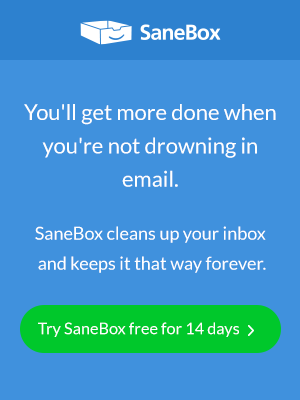 Previous Entry Email Management: How is SaneBox Is Different From Google Priority Inbox?